Today I am joining in with the Papertrey Ink Make it Monday challenge #204 - Watercolour Smooshing. Betsy has a video tutorial on how to achieve this effect and I just love this. Soft pastel colours and some gold and white make up my card for this week's challenge - here it is! 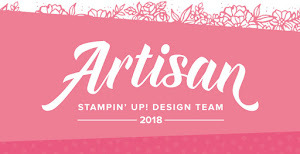 I have used the Life is Beautiful stamp and die set and seriously that set is *cold dead hands*. If I could only choose one stamp and dies set it would have to be this one - it is my absolute favourite! I just love this soft effect! The ink colours I used were Aqua Mist, Berry Sorbet and Hibiscus Burst and I did spray a lot of water to get the effect. I hope you like my creation and if you are joining in with the challenge please leave me a comment so that I can come and visit your blog and leave your cards some love too. Sarah this is stunning! I can't tell you how much I love your gorgeous CAS card! Very elegant ....I could go on and on! Wow! Gorgeous! I love how your smooshing came out! Beyond Gorgeous!!! Lovely, lovely card, Sarah - I saw the ".fr" - are you living in France? I have an adopted family there and I'm coming to visit them in France this fall - Marseilles, LeMans, Paris, Normandy. This is beautiful! I love that you cut the butterfly out of another "smooshed" panel - stunning! Beautifully done, Sarah! Such a CAS card with few elements, but so very classy - each element has its role! Thanks for joining us at the Simon Says Stamp Wednesday challenge! Absolutely stunning card Sarah! LOVE how soft your background came out, and the perfect background for the delicate butterfly. And the gold embossing sets the whole card off perfectly...a totally perfect card! :0) Life is Beautiful is one of my favorite stamp and die sets too...every card comes out so pretty! thank you Marcia yes it's definitely a must have set! I'm with the other commenters....your card is absolutely stunning! I had to pop down and comment on this. This is beautiful. Love the shimmer. I love how you've cut your butterfly from smooshed paper! 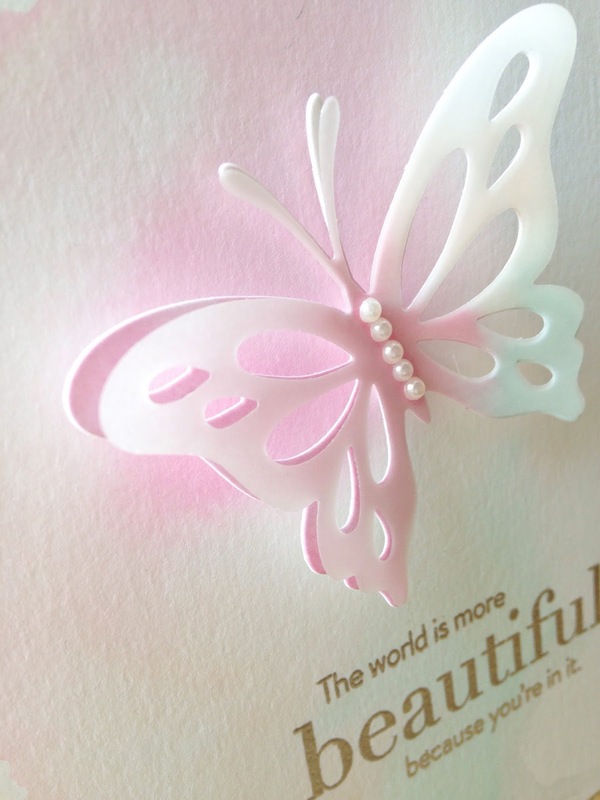 A gorgeous, delicate card! This is so soft and delicate~ So lovely! Sarah, seriously elegant card! I'm so impressed by the impact of simple elements and delicate beauty! LOVE! This is so soft and beautiful. I must not have used enough water. May have to try again. thanks Linda, i did use a lot of water! So sweet! I love the soft colors you chose...very elegant! Oh, wow! This is so delicate and soft! Absolutely lovely! 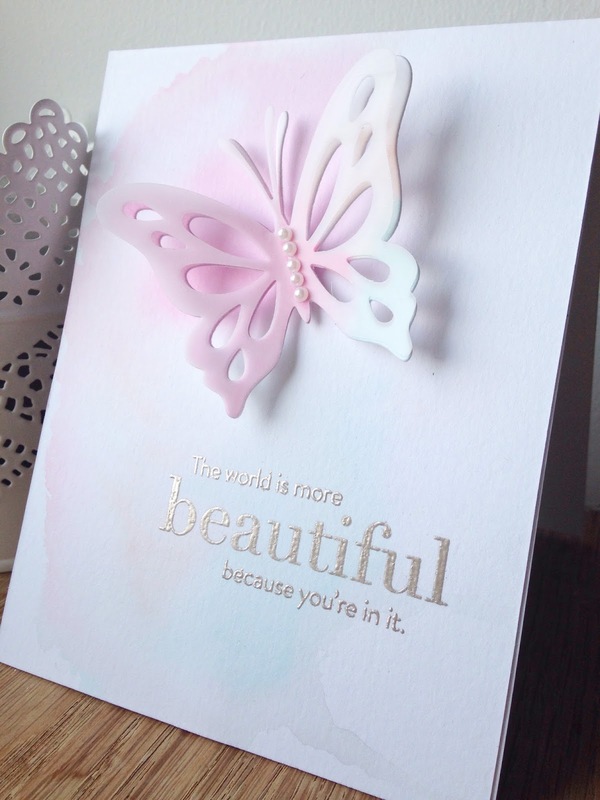 Stunning card, love the soft, watercolor backdrop you created for the beautiful butterfly and sentiment!! oh my. i think this is breathtaking!! perfect! !